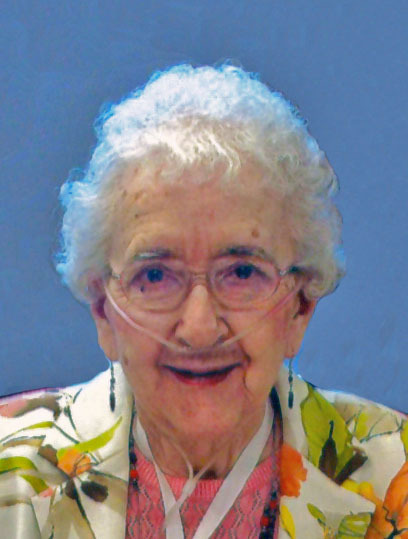 Obituary for Marion Eloise (Hoyles) Thompson | Hanson & Dahl Funeral Home, Inc.
Marion E. Thompson of Dawson died Thursday, March 29, 2018 at Luther Haven Nursing Home in Montevideo at the age of 89. Funeral services will be held on Monday, April 2, 2018 at 1:00PM at Providence Valley Lutheran Church in rural, Dawson. Rev. Kendall Stelter will officiate and interment will be at Augusta Cemetery, Marietta, MN. Visitation will be held on Monday one hour before the service at the church. Marion Eloise (Hoyles, Breberg) Thompson was born on October 17, 1928 in Garfield Township, Lac qui Parle county to William and Amy (McCaskey) Hoyles. She grew up in the Madison area and attended and graduated from Madison High School. Following high school she lived in the Twin Cities for a period of time working at a chocolate factory. On August 6, 1953 Marion married Jerome Breberg at Providence Valley Lutheran Church. They had four children together: Cynthia, Lyle, Douglas and Brian. The family lived in Dawson where Marion was a housewife but also sold Watkins products. On October 24, 1992 Marion married Charles Thompson and she moved to Renville, MN where Marion worked at the Sugar Beet plant. Following Charles’ death Marion moved back to Dawson to live. Marion was a member of Providence Valley Lutheran Church and she was active in the LCW, quilting group and taught Sunday school. She enjoyed gardening, feeding and watching the birds, dancing, bowling and cooking. Marion took a cake decorating cake class and started making cakes for all the grandchildren on their birthdays and special occasions. She was famous in the family for making Barbie Cakes. Family will remember Marion as a strong person who was able to over come many obstacles later in life. She suffered a stroke in 2009 and from Pulmonary Hypertension for over 10 years but always managed to overcome those difficulties. A favorite memory of her children is Marion’s favorite foods, chicken nuggets and Dove Chocolate. Marion is survived by her children: Cynthia (Dennis) Breen, Eau Claire, WI, Lyle (Lynne) Breberg, Dawson, MN, Douglas (Jennifer) Breberg, Dawson, MN; daughter-in-law: Barbara Breberg, Hadley, MN; grandchildren: Christine (Kade) Club, Ashley (Aaron) Haroldson, Dallas (Ben) Kamrath, Erin Breberg(Greg Kreutner), Katelyn Breberg, Jason (Galit) Breen, Emily Breen, Timothy Breen, Derek (Geneva) Breen, Danielle Breberg (Brent Traen), Breanna Breberg (Alexander Stier), Brittany Breberg, Brailynn Breberg; great-grandchildren: Kayli Breen, Chloe Breen, Brody Breen, Conor Breberg, Caden Breberg, Cooper Traen, Elizabeth Club; brother: Dennis (Bonnie) Hoyles, Marietta, MN; sister: Dolores Windingstad, Dawson; sister-in-law, Loraine Hoyles, Madison; brother-in-law, Joe Bolstad, Dawson; as well as other extended family and friends. She was preceded in death by her parents: William and Amy Hoyles; her first husband, Jerome Breberg; her second husband, Charles Thompson; son: Brian Breberg; brother: Henry Hoyles; sisters: Harriet Shephard, Marcia Bergeson, Dorothy Bolstad; brothers-in-law, Jack Shephard, Harold Windingstad, and Myles Bergeson.